(St. Louis, MO) January 11, 2016. Anchor Packaging won the 2016 Sustainability Award Certificate of Merit from the World Packaging Organization (WPO). 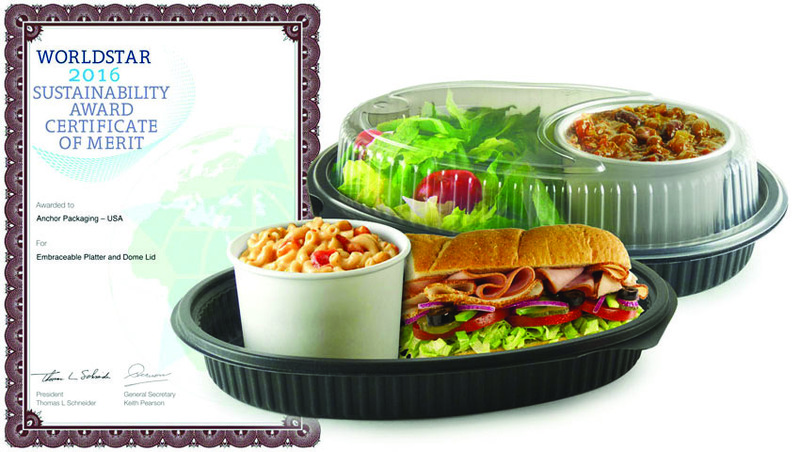 This sustainability award for the Embraceable™ platter and dome follows the prestigious 2016 World Star Packaging Award for this product announced last month. The Embraceable package also won the 2015 AmeriStar Design Excellence Award and the Best New Product in Foodservice by Convenience Store News. WPO judges awarded Anchor a high sustainability score for responsible raw material sourcing and reduction, energy optimization, and recovery that includes reusability, recyclability, and ease of disposal. The Embraceable black platter is an 11” x 8” oval designed and patented with a locator ring in the bottom to hold a standard 8-ounce squat paper food container. This popular serving size for chili, soups, oatmeal, grits, mac & cheese, and many other items often accompanies a main dish, sandwich, or salad. The clear, anti-fog, vented PP lid contains an integral sealing flange that forms a lid over the paper container at the same time that it forms a leak-resistant seal on the platter. This seal eliminates the lid for the paper container, which saves expense and reduces the amount of packaging consumed, thereby reducing carbon footprint. It also improves consumer convenience, as the meal travels in one container, rather than two.